Many people who are eligible to get a reduction in their court or tribunal fees have difficulty following the process to get the financial help they need. When we began thinking about how to improve things for them, we started with the paper form. Fee remission is the name of the process that people need to complete to get money off their court or tribunal fees. To qualify, they need to be on certain benefits or a low income. To apply, they must complete a 2-sided form that comes with 37 pages of guidance. There are roughly 500,000 fee remission applications a year in England and Wales and around 75% of those get rejected. Of the total applications about 120,000 are granted. This means that applicants can suffer inconvenience and stress while staff have to spend time checking and re-submitting forms multiple times. We realised that we needed to address the problems people were having with the paper form before we could move online. We started by speaking to users and court and tribunals staff to map their pain points which we then grouped into 3 areas. The current form uses legal language which applicants have trouble understanding such as ‘Disposable Capital Threshold Test’. The form also requires them to make complex calculations that are explained in the guidance but which few people read. People often submit incorrect evidence in support of their application, for example letters or bank statements that are out of date. This means that their applications are being rejected, even if they are eligible for help with fees. The term ‘fee remission’ isn’t immediately understood by members of the public. There's also confusion about the difference between legal aid and fee remission. To solve this issue, we're removing the need for applicants to provide evidence. Instead, we've introduced an online tool linked to the Department for Work and Pensions which enables court staff to check each applicant's benefit status. Having understood the pain points, we started redesigning and testing new versions of the form. 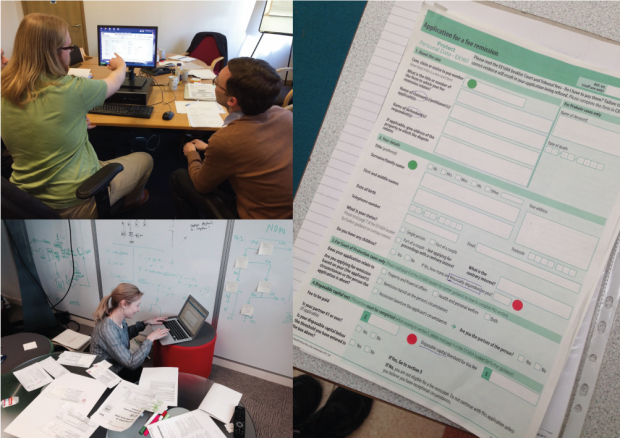 We tested 5 versions of the paper form with applicants, iterating after each round of testing. 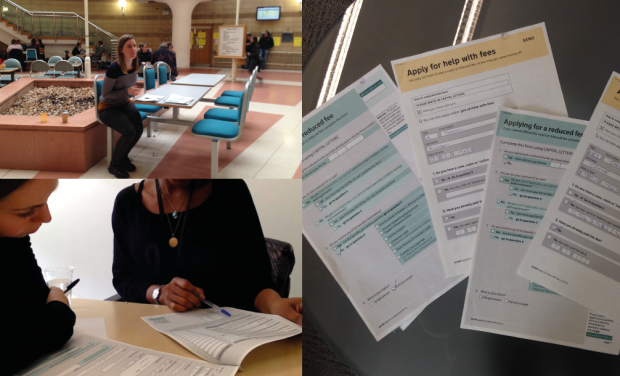 We started with people who were eligible for help and then moved on to those eligible for a reduction of their fee. We used 2 versions of the paper form, with a slightly different question layout and revised content, as well as a new design and different font. To avoid any recency effect bias, we gave out the forms in a different order at each research session. We played back findings to HM Courts and Tribunals Service colleagues and policy teams after each round. This helped us learn how policy informs the design of forms and we worked together to agree on the improvements for the next iteration. One example of this is that the new form doesn’t ask people to enter the court fee amount. We omitted this question because research showed that people nearly always filled in the wrong amount and it’s much simpler for court staff to fill this in. Based on the results from testing with members of the public, we moved to a closed trial in a small number of courts. 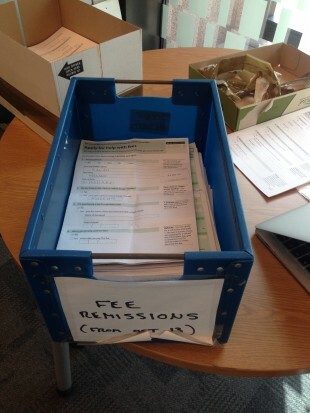 This gave us the chance to see how ‘real users’ in courts and tribunals used the form. We’re now 4 months into the trial and on the 11th version of the paper form. All changes are based on feedback gathered during this period. The results so far are positive. The form is better designed with only 12 pages of guidance now we've removed complexity and unnecessary content. Applicants have told us the form is easier to understand and quicker to complete. For court staff, it means they're working more efficiently with fewer incorrect forms and repeat applications. By going back to the paper form, we've gathered great insights and knowledge of user needs. We believe that the testing and redesigning we've done puts us in a good position to roll out a highly effective online service for applicants. Have you taken a similar approach to improving a service? If you have, we'd like to know about your experience or your thoughts on what we've done. Absolutely loved the showcase of this at the latest cross-government design meeting. Fabulous approach, thanks so much for sharing. As a content designer I was particularly impressed with the way you challenged and simplified the questions asked. I'm working mainly on improving existing online forms. Keen to hear your thoughts on how your approach might be adapted? Hi Tom, the process for working with the paper form was pretty similar to working with the online form. As a team (user research, design, content) we asked lots of questions! That helped us build a really good understanding of how the form should be ordered and what could be got rid of. It was great to be able to start with the paper form, rather than have 2 separate versions of the form, online and paper. In an ideal world we'd be able to do that with every project.